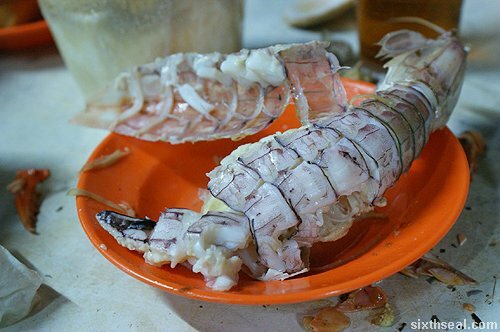 Penang has an abundance of seafood due to its status as an island, and for the very same reason, the seafood also happens to be disgustingly cheap. Thus, a trip to Penang without having seafood is kinda like going to Egypt without visiting the pyramids. We travelled from Tambun, Ipoh to Tambun, Penang after the hot springs trip. Tambun (the one in Penang) is famous for seafood and lies just before the Penang bridge connecting the mainland to the island. We had dinner at Restauran Gee Seng, which looks small on the outside but actually has a huge amount of space which can easily accommodate 30 tables or so, with its own pier for fresh hauls of seafood to boot! Parking is a bit of a nightmare here though, since the road into this area is narrow and the parking attendants frequently shuffle the cars (along with their drivers) around when some poor sod stuck at the back of a matrix of cars has to exit after his/her dinner. This is some sort of spiked clam that requires a toothpick to dig out. The flesh tastes good dipped in chilli sauce, once you’re able to get the damn thing out. It takes a bit of practise. Jolyn here shows us that chopsticks are not merely eating implements. The baked crab at this place comes with a mallet made of wood. You use it to crack open the shell. This style of cooking preserves the natural sweetness of the crab meat. The signature tofu dish at this establishment is different – it’s deep fried into triangular shapes and is a mixture of tofu and some vegetables. It’s quite tasty. The oyster pancake (o chien) isn’t what Sarawakians are used to. Ours is a crisp pancake with juicy oysters in the middle – click here to see a sample. The oyster pancake over here is more like a classic omelet, except with oysters. Next up is one of my favorite dishes – chilli crab served with a side of bread rolls to soak up the gravy with. Let me attempt to describe the pure awesomeness of the chilli crab. The gravy is cooked with starch and tastes sweet and tangy, with a slightly salty note in there somewhere. It’s also infused with egg and at one point; I just discarded all social graces and started scooping up the sauce with my spoon and drinking it. Pure heaven! This is the mantis prawn. I’ve written about the mantis prawn experience here in a post filled with (very justifiable) hyperbole. I can’t believe I haven’t had mantis prawn before! To this very day, it keeps me awake at night, doubting my own judgment and fitness to live. The bill came out to a grand total of RM 253.20 for the six (6) of us. We thought there was an accounting error on the restaurant’s part and made plans for a quick exit strategy since a dinner like that has gotta cost around RM 400.